Social play is about relating to others, playing and making friends - all of which are key elements for social inclusion, adjustment and well-being. 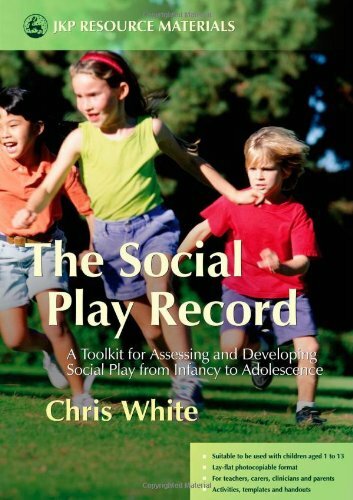 The Social Play Record is a practical resource for assessing and developing social play in children with autistic spectrum disorders (ASDs) or difficulties with social interaction. This toolkit is designed to be used collaboratively with children, parents, carers and practitioners. It is suitable for assessing children of all learning abilities and stages of development, from early infancy to adolescence, and includes photocopiable assessment and intervention materials. A guidance section gives information on what constitutes social play, its significance, development and how to address social interaction difficulties. An assessment section includes recording stages of social play and key abilities, such as independent and peer play, friendship and advanced group skills. An intervention section gives directions for developing key social play skills. Toolkit is assessment resource for parents, teachers and professionals working with or caring for a child with social interaction difficulties.